your color Tropical color themed cards were beautiful and will be so appreciated! We have a winner from our last challenge to announce today! Mary L. entry #20 you are the winner of the Great Impressions prize package!!! Congratulations, we'll be in contact with you soon. This week our theme is Love You! for our heroes to send home to their family and friends! We can’t wait to see your card creations! 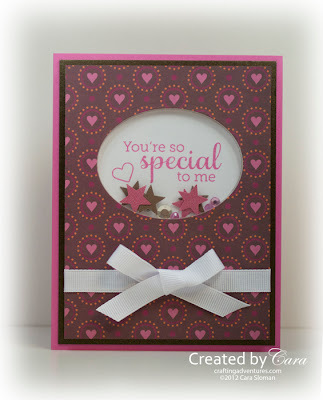 Our sample card makers is Cara, to see more of her wonderful creations please visit her blog Crafting Adventures. Thank you Cara for sharing your awesome creativity with us! Cara, what a beautiful card. Your background paper is really pretty and accents your sentiment and embellishments lovely. Great inspiration. Beautiful inspiration ladies! Mine is almost done, will post later. Love the sample, Cara! Featured Cardmaker: Kathryn B., Denton, MD. Looking for OWHtv Episode 55? Attention Bloggers: Signed up for the hop? Tuesday Tutorial - Sponged Clouds And Waves!